One of my intrests is collecting bayonets. For those who doesn't know what a bayonet is, it's very simple. A bayonet is a knfe that soldiers put at their gun. These are used for close combat. When someone attacks you in a close combat, you can se your bayonet to kill your attacker. Each collector, or the most of them, have one specific theme in their collection. I've chosen to collect Swiss bayonets. These bayonets have a very good quality, and offcourse, the most of them are affordable. Here are the pictures from my collection with a little bit explanation. This is an example from the SIG 57 on a machine gun. This is my bayonet. The SIG 57 is double edged. This means that the 2 sides of the blade are sharpen. 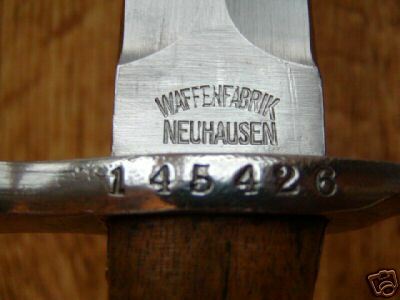 The manufacture date of this bayonet is probably 1926. It is also double edged like the SIG 57. This is a saw tooth bayonet. It has saw tooths at one side of the blade. These were used by engineers, saddle makers, genie troops, ... These types of bayonets were forbidden by the Hague Convention of 1907 because it was a from of unnecessary violence because it makes terribles wounds. The M1889 is the 3 in row of this model. The first model had a normal fuller. The second had a dot in the fuller to keep it stay better in the scabbard. And this third version has an arrested bar, to keep it in the scabbard. I think this is the most rara bayonet of my collection. It is very familiar to the previous M1914 of Schmidt-Rubin. The only difference between the two of them is the bulge at the end of the blade. The M1914 was produced in a larger number than the M1906, that's why this bayonet is more difficult to find, so it's also more expensive. This bayonet is the first Swiss saw tooth bayonet. They look similiar to the Schmidt-Rubin bayonets, but a big difference is that you can only put a Vetterli bayonet on a Vetterli gun, and the same with a Schmidt-Rubin. Alos the materials of the handle are different. 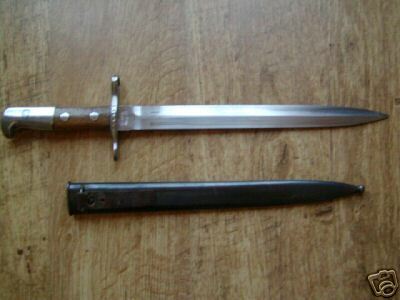 This is the oldes bayonet I have. This is a pike bayonet. The others look more like knives, or swords, but this is really just a metal pin. If you have any questions, you can ask or you can visit the website: www.bajonet.be. I'm a member of this site under the nickname Luigike. At this site you'll find people who have the same intrest as me in bayonets, and not only Swiss bayonets. The site is available in Dutch, English and German.